There are no major economic reports in the US therefore the Eurogroup Meetings will be the most influential event for EURUSD. 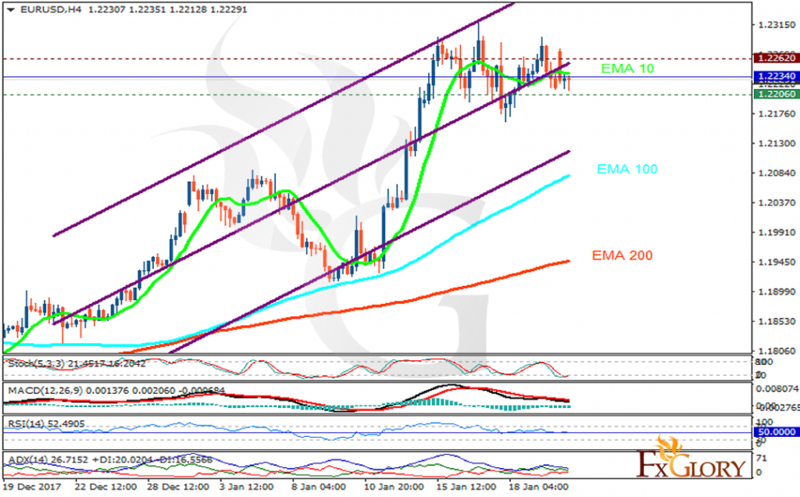 The support rests at 1.22060 with resistance at 1.22620 which the weekly pivot point at 1.22340 is located in between the lines. The EMA of 10 is moving horizontally in the ascendant channel and it is above the EMA of 200 and the EMA of 100. The RSI is moving on the 50 level, the Stochastic is moving in low ranges and the MACD line is below the signal line in the negative territory. The ADX is showing sell signal. The price will continue to grow slowly towards 1.24 area however, if the support line is broken, there might be pullbacks towards 1.215.